For people who have diabetes, the choice of appropriate shoes are an important consideration as footwear can protect against injury to the feet or it can be the cause of it. The task of diabetic shoes and shoe inserts is to decrease the peak pressures (pounds per square inch) experienced by your feet at pressure areas. Running shoes, for example, can lead to reduction of pressures by up to 45% compared to harder soled shoes. Shoes should be comfortable straight off. They should not need breaking in. Try on shoes later in the day. Especially as we get older, or if our health is deteriorating in general, feet are bigger due to swelling in the afternoon. Have your shoes fitted by someone with reasonable training. If your sensation is affected, you may not be able to properly assess the fit or feel if the toes are cramped or rubbing. If you don’t know if you have neuropathy (or decreased sensation) find out at the podiatrist. This is very important information. Stand up when you are trying on shoes. Feet are longer when standing and short shoes can result in cramped toes when you walk. Expensive shoes doesn’t automatically mean good shoes. For example, tough patent leathers can be visually appealing but they do not ‘give’ much. This can cause a great deal of hardship to toes and heels especially. Extra-Depth shoes are available at specialty shoe shops and from our podiatry clinics. These can be good Diabetic shoes choices as they are higher in the toe box. This allows more room for toes and less potential for rubbing off the skin on top of the toe knuckles. Some of these shoes are medical grade and have other appealing factors, such as have no internal stitching. This avoids a potential source of rubbing and blistering. Know that shoes wont stretch where they are stitched. Avoid stitch lines over any bony protrusion, such as clawed toes and bunions. Wear special diabetic socks for long walks and long periods of standing. They have extra padding built in and are made to create graduated pressure across the foot and leg so that a tight seam doesn’t cut into the ankle or reduce blood flow. Other high-tech socks such as those made with copper fibre are also available to address problems such as excessive sweating and infection. Don’t buy off the shelf orthotics for foot pain. You may need individual tailoring in your inserts to reduce pressure on overloaded areas. Seek advice from your podiatrist. Wear new shoes for only one hour at home the first day. Visually examine your feet immediately after taking the shoes off for red pressure areas. Build up wear time slowly and continue to check up for blisters, rubs, etc. Don’t make your first wear an outing where you may have no option to take off a damaging shoe. Feel inside your shoes every time before putting them on. It is surprisingly common to find that items have fallen into shoes or that shoe tacks or the lining materials are protruding or torn creating a rub risk. Throw out socks with holes. Don’t darn them as this will create a thicker area that might damage your skin. The worn out area will always be at a high pressure area and so big ‘clumps’ of darning material may cause further rubbing. Throw out shoes with holes in the lining. Lining can bunch up and rub away skin. Socks shouldn’t be too small so as to cut off circulation, nor too big as wrinkles can cause blisters. Diabetic Shoes that are too big are just as dangerous as shoes that are too small. They allow your foot to slip around inside the shoe causing friction or to run forward and hit the toes on the toe-box of the shoe. Trace your standing foot and check its shape against shoe sole or (even better) remove the insole from the shoe and stand on it directly. Are your toes hanging out over the edge? Does the shoe curve but your foot is straight? This is a great way to assess the potential fit without putting your foot at risk or trying on dozens of shoes. Alternate shoes during the day (if you have sensory deficit) to spread out any potential wear spots. Shoes should be about 8mm or 1/3 of an inch longer than toes and the widest part of your foot should be housed in the widest part of the shoe. Don’t buy a shoe that is way too big because the widest part of you foot will then be sitting back where the shoe has already started to narrow. Learn the ‘lace locking‘ lacing technique to keep your shoes snug around heel without strangling the top of the instep. Your podiatrist may also glue extra padding into the underside of the tongue of the shoe for a snugger fit. Shoes should not have a ‘ripple’ sideways across top of the foot. If they are very much too big here, the material can buckle back inward and cause a ridge at the point where the toes flex. You should however have some spare space around the girth of the foot so it is not too tight. 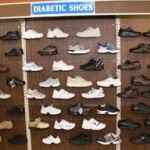 Most shops will allow you to bring your new diabetic shoes with you to the podiatrist for approval. To read this Q&A session on diabetes as a single handbook, or to access the downloadable / printable version, please browse to our Diabetes Info Sheet.